Part I: Visiting both hotels, going to Tabgha for the Multiplication of Loaves and fish. Then a drive to the Lebanese border to visit Banias which is Caesarea Philippi in the New Testament where Jesus renamed Simon giving him the name Peter (Rock). Then to lunch at the Druze Restaurant and driving back through the Golan Heights to Nazareth. Part II: Nazareth, Mass at the Grotto of Annunciation, dinner at Auberge Shulamit. St. Joseph, Father of Jesus? Today we will visit the House of the Holy Family under the Church of St. Joseph in Nazareth. Here I will give my short talk “A Day in the Life of the Holy Family — telling about the quiet, strong hero and father of Jesus. Father of Jesus? I don’t like most artistic representations of Joseph. He is often portrayed as a sissy — even somewhat effeminate and soft, or on the other hand, well groomed and European. Having spent a lot of time wandering the paths of Israel, I can assure you that Joseph could not have looked like the often portrayed sissy! He would be dark skinned and swarthy, sunburned and weathered. Joseph was strong and he didn’t have soft hands, perfect hair — and he didn’t smell like an Aqua Velva man any more than Jesus did. Remember there were no showers, deodorant, toothbrushes or washing machines — and it can get pretty hot and humid! This is my favorite picture of St. Joseph. We used it in our Mary, Mother of God DVD. I think it’s very close to what St. Joseph the Worker really looked like. 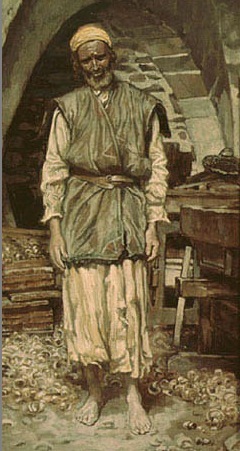 It was painted by my favorite biblical painter — James Tissot — a French convert to the Catholic Church. For the WHOLE STORY, buy our documentaries Mary, Mother of God and Jesus, Word Became Flesh. They make GREAT Christmas presents. Click here for more info or to purchase.